Today I felt like going all feminine and floral and this is what I came up with. 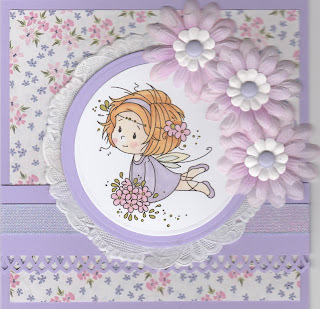 The stamped image is from Wee Stamps and is coloured with promarkers and then layered using a lace doily at the back. The strip has been punched and glittery ribbon added. The beautiful background paper is another magazine freebie, isn't it gorgeous? The assorted layered flowers with brads are all from my stash. An adorable card Christine, a lovely design with such pretty colours and papers........your image is so sweet and pretty details! !